Prepping for a maintenance exam, or Release Exam, is pretty much like studying for any test. First thing you need to do is watch the webinar that is prepared by Salesforce. Once you have become certified, links to the maintenance exam webinars are sent to you via email from Salesforce.com shortly after a product release. Certification maintenance announcements are also made on the Salesforce.com Certified Professionals group on LinkedIn. The webinar covers 95% of what is on the maintenance exam. The other 5%, in my opinion, you have to infer based on your existing knowledge of the Salesforce platform or scour the release notes to know the correct answer. How do you prep? Everyone learns differently, but I take notes throughout the webinar. I’m sure some folks can watch the presentation and jump right in and take the test. I’m a bit old school – I take notes using MS Word and occasionally use Snag-It for a screen capture if I think a slide is particularly helpful. Then I re-read the notes a few times and try to take the test the same day while all the content is fresh (which is hard to do with the demands of work!). Unlike the exams to become initially certified, the release exams are “open book” and not proctored. You can have your study sheets, or even Salesforce.com’s help & training up in a window if need be, available by your side as you take the test. If you do the prep, study the exam objectives, passing the maintenance exams should not be that difficult. Typically you’re going to have 10-15 questions and 30 minutes to take a release exam. They are multiple choice questions and you have the ability to mark questions in the online exam so you can go back and review a question you’re hung up on before submitting your answers. You will know immediately after submitting your exam if you’ve passed (but not how many questions you answered right). I have also noticed that there is a great deal of content overlap between the Administrator maintenance exams and the Developer maintenance exams. 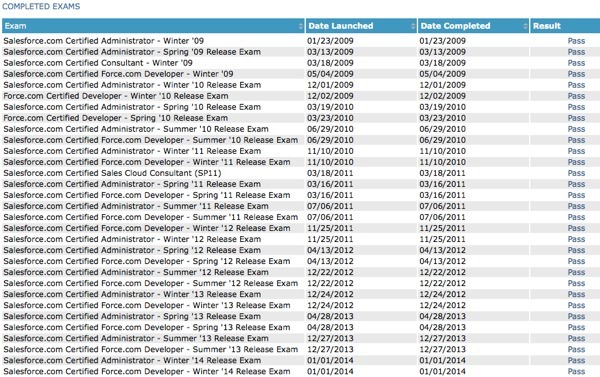 To take the maintenance exams you have to log into: www.webassessor.com/salesforce. From what I remember the training presentations average a couple of hours long with good navigation to pause and find particular topics. For those LMS (Learning Management System) geeks out there, Salesforce.com is using plateau.com to host the training content ;). Note: The maintenance fees are based upon when you initially took the exam. You’re charged once per year for each track: CON/ADM is one track, the other is DEV, so max is $200/yr. Check this post on forcecertified.com .com for details (Thanks John C. for the clarification).